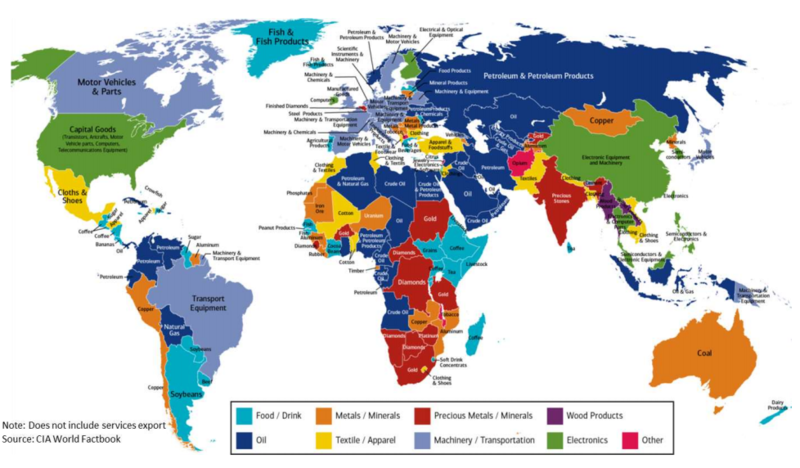 Do you know what your country’s biggest export is? Now, thanks to this map put out by the Bank of America Merrill Lynch, you can find out. The map does not include the export of services, but highlights some interesting insights and global trends. Part of their Transforming World Atlas, the report highlights “how many countries in the world are dependent on commodities as the primary source of foreign income.” In a volatile global commodities market, it is a reminder of the risk posed by falling oil prices to economies around the world. The map uses 2014 data from the CIA World Factbook. For a larger version of the map, click here. What is the world exporting? The map highlights a number of global patterns, notably the importance of oil exports to many economies. Dark blue shading represents countries where oil is the biggest export and shows the importance of oil not just in the Middle East, but across Asia and Africa and South America. Other commodities, including precious metals and minerals, also play a significant role in the global economy. Across much of Asia and Africa, large numbers of countries shaded in red and orange indicate the importance of exports such as gold, iron ore, and coal to these nations. Interestingly, and perhaps unexpectedly, India’s biggest export is precious stones. Conversely, European exports are focused on machinery and transportation. Electronics dominate in both China and the USA, while food and drink and textiles top the bill in a number of countries. As the World Economic Forum’s E15 Initiative argues, there has been a “significant slowdown” in global trade since the 2008 financial crisis. An effective global trade and investment system is key to boosting economic growth and meeting global challenges. Understanding the national and international picture is central to ensuring the effectiveness of this system. The global export situation is just one part of developing this understanding and improving efficiency, as well as understanding the risks faced by countries around the world. Which economies export the most?